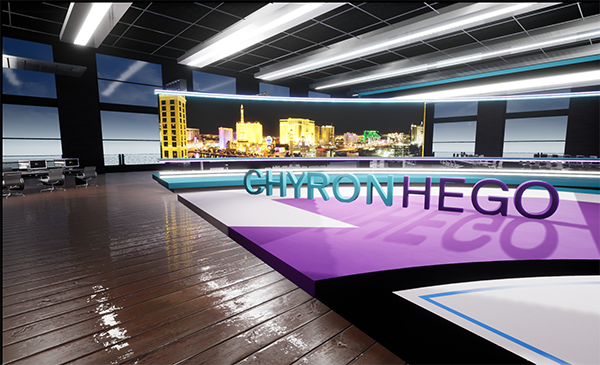 LAS VEGAS — April 7, 2019 — ChyronHego today introduced Fresh, an all-new graphics-rendering solution that integrates Epic Games’ Unreal Engine 4 (UE4) with ChyronHego’s augmented reality (AR) and virtual set (VS) software. Fresh makes news, weather, or sports look more real than ever because the AR graphics — including text and titles — are all completely integrated into the Unreal scene. As an industry first, Fresh includes a robust primitive library with 3D graphic objects, including text, that is fully integrated into the UE4 environment. This feature enables producers to add eye-catching titles and other 3D elements quickly and easily without having to rerender them for the gaming engine. The built-in primitive library sets Fresh apart from other AR broadcast graphics systems that require the broadcast elements to be created in a traditional graphics rendering engine and then added as a separate layer on top of the Unreal scene. Not only does this requirement add more time and complexity to the process — a liability during a breaking news or weather event — but the resulting graphics lack the realism and “look” of the gaming engine. With Fresh, however, the graphics are rendered as part of the UE4 scene and carry the same photorealistic and hyper-realistic look as the other scene elements. Through a seamless integration with ChyronHego’s CAMIO, Fresh enables a unique, MOS-driven workflow that automatically incorporates any AR/VS element into the station’s familiar news environment. This integration makes it even easier for producers to tell a better story because AR graphics are part of the news rundown along with every other graphic element and all other parts of the broadcast lineup. Fresh offers another unique and powerful capability for broadcast AR graphics. It is the only solution to offer preview capabilities, giving producers the ability to verify accuracy of the graphics before they’re aired. In this manner, broadcasters are able to avoid costly on-air mistakes (for example, incorrect election results) that can have large-scale consequences, such as loss of revenue and reduced credibility. With the built-in screen parallax features in Fresh, the virtual set background moves and changes realistically in coordination with camera motion to add to the set’s realism. Fresh can also combine live feeds within the UE4 scene, giving producers the ability to tell an even better and more compelling news story with a combination of highly sophisticated AR graphics and live feeds or clips. In addition, Fresh offers a unique zero-delay function that, when used with ChyronHego’s robotic tracking head solutions, removes the need for additional equipment and complex audio processing to compensate for the delay between AR/VS elements and other content. ChyronHego, a portfolio company of Vector Capital, is a global leader in products, services, and solutions for the broadcast and sports industries. Specializing in live television, news, and sports production, ChyronHego offers some of the industry’s most widely deployed solutions — including Lyric®, the world’s most popular broadcast graphics creation and playout offering; the all-new CAMIO Universe newsroom workflow; and the TRACAB™ optical sports tracking system. Headquartered in New York, ChyronHego also has offices in the Czech Republic, Denmark, Finland, Germany, Mexico, the Netherlands, Norway, Singapore, Slovak Republic, Sweden, and the United Kingdom.